Now retired, former ER physician Dr. Wayne Wheeler relaxes in his Portsmouth home. Having reached 74 years of age in February, and only having officially retired two years back, Wayne Wheeler of Portsmouth has been a medical doctor (working for decades in the ER of Southern Ohio Medical Center as well as at least one of its predecessors,) an attorney, an accountant, a military meteorologist, an addiction counselor, and an Air Force veteran who served in Laos during, as he put it, the Vietnam Conflict. Further, although he didn’t talk about it much, some of that military service apparently involved jumping out of planes. All in all, Wheeler holds a total of five academic degrees, including two doctorate level degrees, one in medicine, and the other being an MBA. His undergraduate degree was in mathematics and Wheeler confessed that nowadays, he takes advanced calculus classes online just for fun. Not surprisingly, he also is an avid reader, still perusing medical journals, and apparently a particular fan of Leo Tolstoy. It might not be the best known of holidays, but March 30 is officially, by act of the U.S. Congress, Doctors Day. To help mark the day, the Scioto County Medical Association suggested an interview with Wheeler might be just what the doctor ordered for the Daily Times. For his part, Wheeler was more than willing to go along. However, he several times requested the story be about medicine, it’s advances and how it has changed since he began his career all those years ago and not about him specifically. Being a physician of one sort or another seems to be something that runs in Wheeler’s family. His father was a medical doctor, one daughter is a medical doctor and the other is a veterinarian. Wheeler said one obvious way medicine has changed since the days when his father practiced is a huge proliferation in the number of prescription drugs available. Wayne Wheeler said when his father Norman Wheeler practiced there were maybe a total of 25 antibiotics from which doctors could choose. Wheeler said that number has now easily reached over 200. Naturally, most of those medicines each have their own unique properties. Modern physicians must stay as up-to-date as humanly possible and the advancements in pharmaceuticals and of course other aspects of practicing medicine. Wheeler said his father certainly had access to an x-ray machine but certainly also did not have access to such things as CT scans. He said doctors nowadays often have portable ultrasound machines available to them in their offices, something unheard of not all that long ago. As a side note, Wheeler readily admitted he never really got the hang of using the ultrasound himself. Wheeler began working as an ER doctor at the former Mercy Hospital in Portsmouth which later merged with Scioto Memorial Hospital to become SOMC. He added the differences between ER operations back when he started and current emergency procedures is “astounding.” Wheeler said physicians nowadays, if they need a bit of information, naturally go running to some online database or another. He remembers the days when physicians, if they needed some bit of information or another, would go running to actual books, some of which they would keep chained up to ensure volumes did not disappear. Wheeler told another story of someone he described as a “hotshot ER doctor from Columbus” coming down, apparently, to share his knowledge with doctors in Portsmouth. On the day a trauma case arrived at the hospital’s front door, the hotshot doctor did what was probably second nature to him and asked where the hospital’s trauma team was. Wheeler said a nurse informed him he was the trauma team. “He left and never came back,” Wheeler said. Wheeler spent lots of time over the years volunteering and otherwise working as an addiction counselor for the Counseling Center in Portsmouth. He is a big supporter of medically assisted addiction treatments, saying he regularly prescribed Suboxone and in earlier days, methadone. Wheeler argues strenuously addiction is not a choice. “It is a treatable disease,” he said, bucking against the stigmas attached to drug use, the old idea users are somehow mentally weak or flawed in some way and it is that flaw that leads to addiction. While Wheeler did not want this story to be about just him, after so many years spent in emergency rooms, the Daily Times could not help but ask if he had any memorable stories from those days spent dealing with medical crises. Wheeler admitted he hated working prom nights and high school graduation nights. 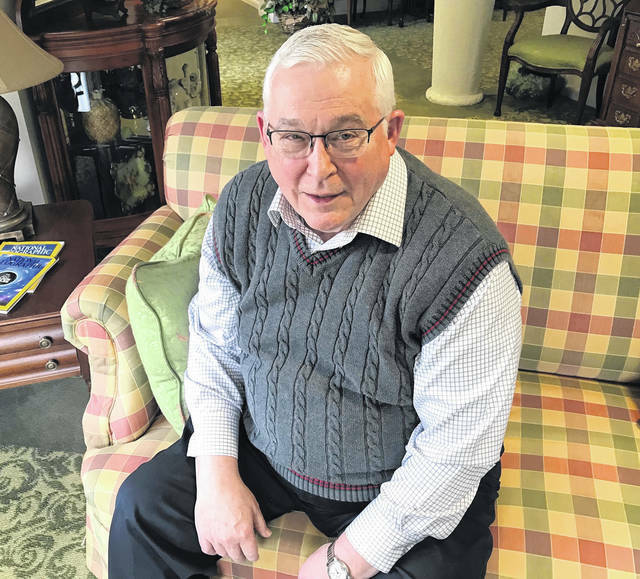 On the flip side, Wheeler said his fondest memories of working the ER was chatting with World War II veterans and persons who had survived the 1937 Portsmouth flood. For the future, Wheeler said he is content reading medical journals, though he admits there are some journal articles that are now over his head, another sign he adds of the advances in medicine. He also pursues online noncredit college classes, including the calculus courses mentioned earlier. https://www.portsmouth-dailytimes.com/wp-content/uploads/sites/28/2019/03/web1_Wheeler-1.jpgNow retired, former ER physician Dr. Wayne Wheeler relaxes in his Portsmouth home.